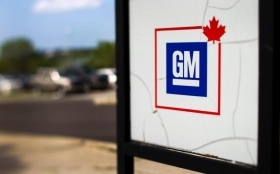 General Motors and the Canadian union Unifor have not yet made any significant progress in their talks to hammer out a new contract, the labor group's President Jerry Dias said on Saturday as the sides entered the final stretch of negotiations. GM and Unifor have been divided over union demands that the carmaker commit to new vehicle models at its Oshawa, Ontario, plant. A four-year contract covering some 20,000 Canadian autoworkers at Fiat Chrysler, Ford and GM expires on Monday. The union chose GM as Unifor's strike target for the talks, with any deal setting the pattern for the next round of talks with manufacturers Fiat Chrysler Automobiles and Ford Motor Co. Speaking briefly at a Toronto hotel before the day's talks began, Dias said he is cognizant of the looming strike deadline of 12 a.m. ET Tuesday, by which time workers would go on strike if the parties do not reach a deal. GM's plant in Oshawa, just east of Toronto, is on the verge of shutting one of its two assembly lines, with several vehicles either already produced elsewhere or expected to move in 2017. Toronto's Globe & Mail this week meanwhile reported that the Canada government has "quietly signaled" to automakers that it will change key terms of a 2008 loan program, the Automotive Innovation Fund, to convert it to a grant program in order to encourage investment in existing auto plants in Canada. Dias on Friday told the Detroit Free Press that such a move "is very positive ... Do I believe that that will play a role and provide an assistance to us in our negotiations? The answer is yes." GM on Friday said only that it remains focused on working with Unifor to reach a "mutually beneficial and competitive new agreement," but did not reiterate its previous stance that it will make future product decisions for Oshawa only after a labor agreement. A strike at Oshawa, which assembles the Chevrolet Impala, Buick Regal and Cadillac XTS sedans as well as some other overflow work, would not cause much hardship for GM. But if workers at its Ingersoll, Ontario, CAMI plant, who have the same union but a different contract, support the strike and refuse to install engines and transmissions diverted from U.S. or Mexican plants, it would be more damaging for GM. The CAMI plant assembles GM's strong-selling Chevrolet Equinox and the GMC Terrain. Unifor, which represents more than 20,000 autoworkers, has said its top priority is securing production of new vehicle models. Pensions and wages are also on the table. Nearly all of Canada's auto industry is in the province of Ontario, which some automakers have found more expensive than other places, such as the southern United States and Mexico. The U.S. United Auto Workers has said it will support its Canadian counterpart, but declined to say whether it would refuse work at American GM plants in the event of a strike north of the border.